Increasing visibility online should be at the core of every business marketing strategy. Driving traffic to your website and getting noticed by search engines takes a lot of time and effort. Google, Yahoo/Bing, Facebook, Foursquare, and Twitter. Superpages, Yelp, and Yellowpages.com. Shall we keep going? What about mobile search on iPhone, Android, and Blackberry? And be on the lookout for these new trends: tablets, in-car search and web browsing on your television. The point is, there are hundreds of digital touch points out there today. On all of them, consumers are looking for information about businesses like yours. Whether you know it or not, your business is already listed on many digital search portals, and missing from others. How can you know that your business is represented in the best possible light? How can you get listed everywhere without spending hours and hours on research and manual effort? 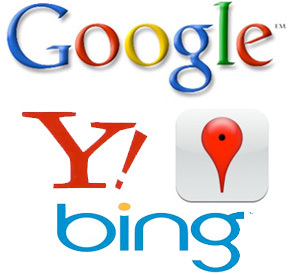 It’s a known fact that search engines like Google and Bing/Yahoo! value the number of incoming links pointing to your site when deciding its ranking. It has also been established that links that are obtained naturally and those that are non-reciprocal in nature (i.e., which do not require you to link back to a site) are more important and valuable than links that are exchanged among sites. So with links being as important as they are, and ‘one-way’ links coming at a premium, the question arises as to how to go about obtaining these one-way links. This is how directory submissions can help. Web directories serve as a catalog of websites and provide links to the various sites listed under the relevant categories. Many of these directories accept websites for inclusion at no cost. Submitting your site to these directories under the most relevant categories would get you a quality one-way link. This makes directory submissions one of the best and easiest means of obtaining these quality inbound links. Most directories allow you to provide a link with keywords describing your site. It’s not easy getting links to your site with the keywords you want and directories serve as the easiest medium for getting such links. Getting links with targeted keywords/phrases can have search engines favoring your site over others when ranking for the given terms. There are literally hundreds of companies that can help your business achieve directory submissions. However, the biggest mistake most companies make is having inaccurate details about your business floating around the web. Accurate listings are the first step in online marketing. More than 40% of online listings are inaccurate, incomplete, or missing. Seemingly insignificant discrepancies like the one site listing your address with “Suite 200” and another site listing “Ste. 200”, can mean that the search engines will not place trust that your information is correct and not pass any relevance on to your website from that listing, because the search engine sure if, in fact, that is meant for you. Is your business listed on mayor search engines, local review sites, online business directories, and social networks? 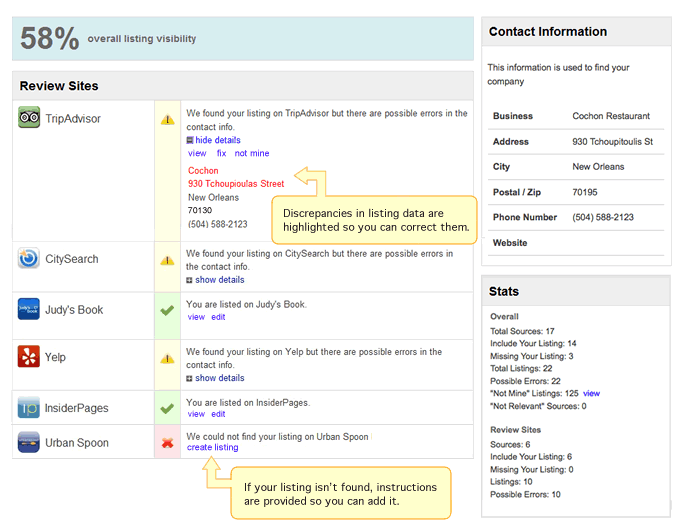 The visibility feature gathers all the locations on the web where your business listing can be found – and shows where you’re underexposed. Submitting to directories can be a time-consuming process and finding the right directories to submit to can take quite a bit of effort. To save yourself the trouble, you may use directory submission services like ours to get your site submitted to all the top quality SEO friendly directories out there. We have a sizable team of directory submitters who are well-trained in submitting to web directories. We make sure that each directory link you receive is recognized and valued by the search engines by constantly checking the directories on our list for being SEO friendly. We offer you several submission options. You can submit your site to as many or as few directories as you wish. You could submit according to the PageRank of the directories and you can also choose to slow down the pace at which we make your submissions, spreading out the entire process over 2-5 weeks. We provide you with a live-reporting feature so that you can keep track of your submissions when they’re being made, as well as a detailed report of all your submissions on the completion of your order. The Xcite Group is here to help. We’re your one-stop service, providing access to all of the search sites consumers are using to find information. This will enable you to monitor any possible discrepancies in your business information, make it easy for you to gather and observe your online reviews and mentions, and see what your competitors are saying as well. Contact us today to see how we can help.